Welcome to the pages of the Big Data Analytics Group at Saarland University. 11.3.2019 New paper "Blurring the Lines between Blockchains and Database Systems: the Case of Hyperledger Fabric" accepted to SIGMOD 2019. 6.10.2018 JD will be speaking at Frankfurt Data Science on Nov 1. 27.9.2018 JD will be speaking at the IT-Themenabend on „Künstliche Intelligenz oder Mensch - wer entscheidet? ", Nov 2018. 14.9.2018 JD will be speaking at PyCon Karlsruhe. 14.9.2018 JD will be speaking at PyData Frankfurt. 14.9.2018 JD will be speaking at code.talks, Hamburg. 4.9.2018 JD interviewed on local TV. 1.8.2018 JD's PyData 2018, Berlin, talk available on youtube Big Data Systems Performance: The Little Shop of Horrors. 24.4.2018 New paper "An Analysis and Comparison of Database Cracking Kernels" accepted to SIGMOD DaMoN 2018. 9.4.2018 Our proseminar Einführung in Data Science has received the award of the students' council representation (Busy Beaver Award) for the best seminar in winter term WS 17/18. 14.3.2018 We will be coorganizing another Data Science summer school in September (stay tuned). 6.3.2018 New paper "Accelerating Analytical Processing in MVCC using Fine-Granular High-Frequency Virtual Snapshotting" accepted to SIGMOD 2018. 5.1.2018 Slides of JD's VLDB 2017 keynote Deep Learning (m)eats Databases. 23.12.2017 New paper "Adaptive Adaptive Indexing" accepted to ICDE 2018. 16.11.2017 JD will give a keynote at the DEEM-workshop (Data Management for End-To-End Machine Learning) at SIGMOD 2018. 02.05.2017 We are hiring! HiWi Position as a C++ Developer with a focus on Testing available. 17.03.2017 We will be co-organizing the Data Science Summer School at Saarland University, September 18-22, 2017. 15.12.2016 Due to an internal group reorganization we lost two Ph.D. students (Felix Martin Schuhknecht and Endre Palatinus). However, we could replace them by two new postdocs (Dr. Felix Martin Schuhknecht and Dr. Endre Palatinus). Congratulations! Great job! 30.08.2016 At VLDB 2016 our group will present three papers (two at the conf, one at the ADMS-IMDM workshop), see here, here, and here. We are also involved in a tutorial on Operational Data Analytics (thanks to Alfons Kemper for replacing me!). 10.03.2015 video of JD's keynote The Case for Small Data Management given at the German Database conference BTW 2015 is online. This is the 45 minute version of my CIDR 2015 Gong Show talk. 10.03.2015 Our mini-paper On the Surprising Difficulty of Simple Things: the Case of Radix Partitioning was accepted at VLDB 2015. 20.10.2014 Our paper A Comparison of Adaptive Radix Trees and Hash Tables was accepted at ICDE 2015. 03/2014 JD participated in a Dagstuhl Perspectives Workshop on Massively open online courses, current state and perspectives. A manifesto summarizing the workshop will appear in May. 29.11.2013 Artikel Die Umgedrehte Vorlesung - Chancen für die Informatiklehre angenommen im Datenbank-Spektrum. 05.03.2013 We are offering postdoc positions in the area of big data. 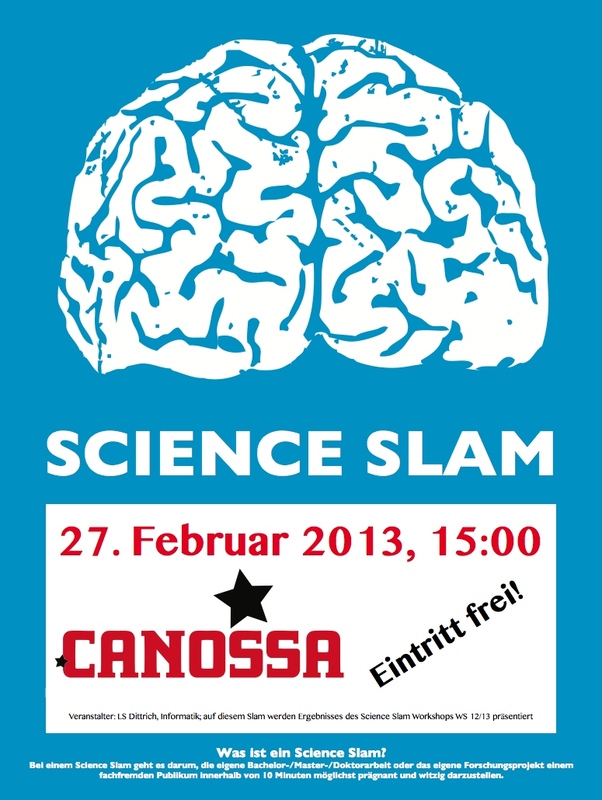 04.03.2013 We are running three mini science slams at CeBIT on March 9 at 11am, 1pm, and 3pm; Halle 9, Stand 34. Two students of my science slam workshop will also present. 01.02.2013 Full paper accepted at PVLDB vol.6/VLDB 2013: A Comparison of Knives for Bread Slicing. 17.01.2013 Gong show video is online. 14.01.2013 New Datenbank Spektrum article Efficient OR Hadoop: Why not both? available. 17.12.2012 TR on Towards Zero-Overhead Adaptive Indexing in Hadoop is available. 06.12.2012 Slides on Efficiently Indexing AND Querying Big Data in Hadoop MapReduce are available.